This topic contains 24 replies, has 2 voices, and was last updated by Alexander Bautz 1 year ago. Unfortunately I don’t have any code ready, but if you can tell me which SharePoint version you use I might be able to help you with a code snippet to get you started. I am working with sharepoint 2013. Any help is much appreciated. OK, I’ll try to get something made during the weekend. Could you give me some more details about how you want it to work? – is it just a list with all the “Title” elements that you can click to expand the “Narrative” text? Exactly what I want to do. There is a faq accordion floating around but really whatever you come up with I would be much appreciative. Again this has bugged me for two months now. So to round up the list lives on one sub site and I want to view the display on another subsite. When the title is clicked the narrative should display below it. Thank you so much for your help and all of the great solutions to date. I have attached a code snippet. Change the “WEB_BASE_URL” and “LIST_NAME” and ensure the “Narrative” field name is correct. Put the code in a HTML for web part or script editor web part or link it in from a file using the Content Editor Web Parts “Content link” option. The end result should look like the attached image. Hope you can use this as a starting point for your solution. This works great thank you so much. How would I go about filtering it so only the last 25 hours (yes last 25 hours) of created items show up? The only thing I need is a 25 hour filtering option and the ability to use list views other then that this solution is spot on. Awesome. One more request, with a provided latitude and longitude in its respective columns, can I display a google map below the narrative with a icon on the lat long center point? And maybe a edit icon to modify the narrative that would be amazing. You are the man thank you so much. heres a quick question if there are no results to display how would a send a “no results” message to the view? Here’s another question, hate to be a pain. If the list produces ten items how do I highlight odd rows blue and even rows red. Also If Item name contains the word bad how do I highlight that word specifically yellow? You can modify your code like in the attached image. It seems the alternating row colors is preventing the titles from expanding any thoughts? Disregard I found the problem this awesome thank you so much. Beer is coming your way at my next check. How would I make this asynchronous. So if a new list item is added it should appear without refreshing. To ensure only new items are drawn you must change the code like highlighted on the attached image. Please note that I haven’t tested this code, but I think it should work. Doesn’t seem to be working, it will load on page execution. But if I change a list time in a second window the information doesn’t redraw on the other. Any help you can provide will be greatly appreciated. My original reply was intended for new items and not modified items. I have changed it to detect if the item has been modified since last draw – and in case, it will replace the item. Keep in mind that this snippet will not reflect your local changes to look over it and modify your original. How would I work these into tabs? I have three accordion lists each separate from each other. I would like all three to be in a tab with the accordion. The site is setup for three web part zones and would like to have three tabs with three accordions each going across? Any ideas? I’ve rewritten the snippet to build some tabs, but please not that it has been thrown together without much though so use it as a starting point and see where you can get it with a little tinkering. 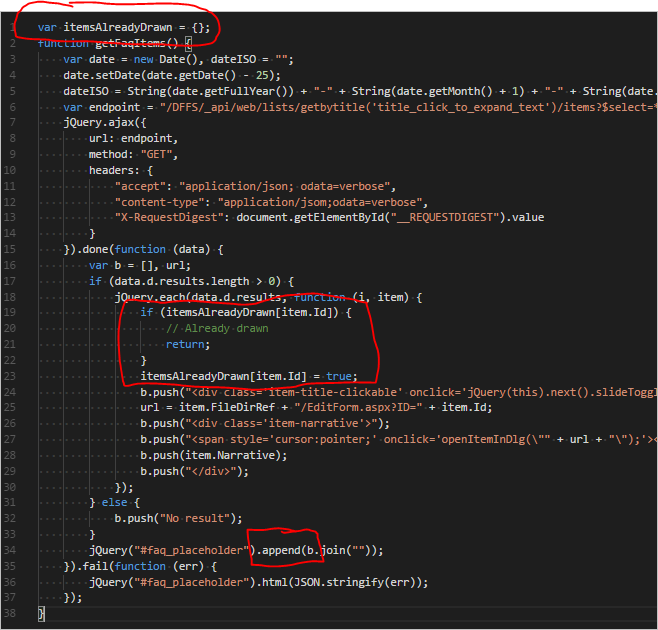 Keep in mind that this snippet will not reflect your local changes to look over it and modify your original.